In the largest network of online college and high school radio stations, you would expect the biggest, most senior or most affluent of the student radio clubs to maintain the leadership role for its sister affiliate stations. However, a new affiliate station in Plymouth, Indiana has stepped up to become one of the nation’s most active and successful online stations, even though the station comprises the youngest group of broadcasters in the IBS Student Radio Network—and said to be the only 24/7 junior high radio station in the United States. In little more than six months from launching Digital Storm Radio, the students of Lincoln Jr. High School, under the direction of Ms. Paula Neidlinger, have established their station as living example of what student-run radio can achieve. Not only have they brought home three first place awards from this year’s premier college broadcasters’ conference in New York City and tackled the task of creating their own staff training videos, but they have found the elusive formula for funding their radio station through local sponsorships. Last month at the Intercollegiate Broadcasting System’s 75th annual International Conference, the LJH Digital Storm team were finalists in five categories in the high school division, walking away with three wins: Best Spot News: Trenton Arveson, Nikki Laucis, and Brittney Klotz; Best Sports Update: Soren Houin and Shaun Frantz; and Best Sports Program: Adam Hunter and Korey Kopetski. Storm Radio is one of the few “high school” stations to schedule live call-in talk shows, and has been a beta partner in testing our recently announced Backbone Talk™ broadcast phone system in the cloud. The LJH radio team saw this as an opportunity to put their own spin on documenting a new technology, so they applied their media expertise and made their own training video showing how to configure a mixing board for “mix-minus” and how to screen phone calls through their Mac® computers. We are proud to feature this video on the Backbone YouTube page. How are they funding the station? Tackling one of the most important, and difficult, subjects in broadcast media, the team have secured six sponsors from their community, including a funeral home, a pizza parlor, a Ford dealership and Coca Cola. In addition to performing live reads, the students have produced commercials for each sponsor. These spots run throughout the day and night, using the Backbone Radio automation system. 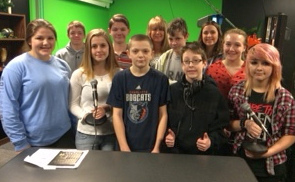 Storm Radio, is one part of the Interactive Media program at Lincoln Junior High (Plymouth, IN), which is a new program this year. The radio station is a 24/7 Internet Radio with the call tag – STORM RADIO – “Ride the Waves.” The radio station is Internet based, so it’s available through the TuneIn App on iOS and Android devices, the LJH DigitalStorm website-http://www.ljhdigitalstorm.com/ , and the Internet at: http://tunein.com/radio/Storm-Radio-s231710/ Students research, write, create, and broadcast daily and provide 100 percent of the programming. Thank you for the kind words. The best thing I ever did was launch our own school radio station. Thank you Backbone for your continued support! Hello Adam Hunter! How can I see/hear one of your broadcasts on my computer? Remember that I am old and not very good at this stuff. You should come to visit and report on the Senior PGA tournament over Memorial Day weekend. Aunt Lin in French Lick, IN.